As we are aware, a lapse of appropriation for most Federal agencies, including the Social Security Administration (SSA), recently led to a temporary shutdown of many Government functions. I appreciate the opportunity to explain how SSA planned for this contingency and implemented its shutdown plans. I would like to clarify that nowhere in either the statute or guidelines does the word "essential" appear. It is extremely unfortunate that this word was used during the recent furlough to refer to Federal employees as being "essential" or nonessential" employees. In fact, the statute says that when there are no appropriations, all employees are furloughed except those performing emergency activities that include, among others, the provision of mandatory benefit payments and the protection of life and property. If we were furloughing only “nonessential" employees, no employee would have been furloughed because they are all essential. My testimony will generally address the questions you raised in your letter of invitation, beginning with a description of SSA's process for developing and implementing shutdown plans. Office of Management and Budget (OMB) guidance requested that each agency develop an operational plan for an orderly shutdown in the event of a lapse of appropriations. SSA's contingency plan consists of individual plans, approved by the Commissioner, which are developed and maintained by Deputy Commissioner (DC) l e v el components. If notified by OMB of a funding lapse, the Commissioner will activate the SSA Command Post, which will oversee the implementation of SSA's contingency plan and provide guidance. The Command Post, which is comprised of representatives of the Office of Personnel and each DC component, will immediately notify the DC-level component heads to implement their individual contingency plans. I am attaching to my testimony a summary of SSA's procedures f or s h u t down and startup due to lapse of appropriations. This document contains more detailed information regarding SSA's shutdown plans. We informed OMB of our shutdown plan in advance in order to ensure consistency among Federal agencies in the interpretation and application of pertinent statutes. We received a number of issuances providing guidance and information from OMB and the Office of Personnel Management (OPM). I can assure you that SSA has adhered to all guidelines and standards with respect to developing and implementing an appropriate contingency plan. You asked about the number of SSA employees furloughed, the number who continued working, the functions they performed, and the rationale for continuing those functions. During the orderly shutdown effected on November 14, and consistent with our shutdown plans, SSA furloughed approximately 61,000 non-excepted employees and retained about 4,800 excepted employees beyond the lapse of appropriations. This was consistent with SSA's previously established shutdown procedures. The attached chart shows the categories of activities for which employees were retained and the number of excepted employees involved in those activities. The functions these employees performed were mainly in direct support of paying benefits to currently enrolled Social Security, Supplemental Security Income, and Black Lung beneficiaries and to maintain essential records f or those beneficiaries. It is our view that, because there were appropriations for the program costs of paying benefits, this necessarily implied authority to incur obligations for the costs necessary to administer those benefits. Other functions permitted under applicable statutes, including the Anti-Deficiency Act, during a lapse in appropriations related to areas such as protection of life and property and all activities necessary to support the excepted functions. 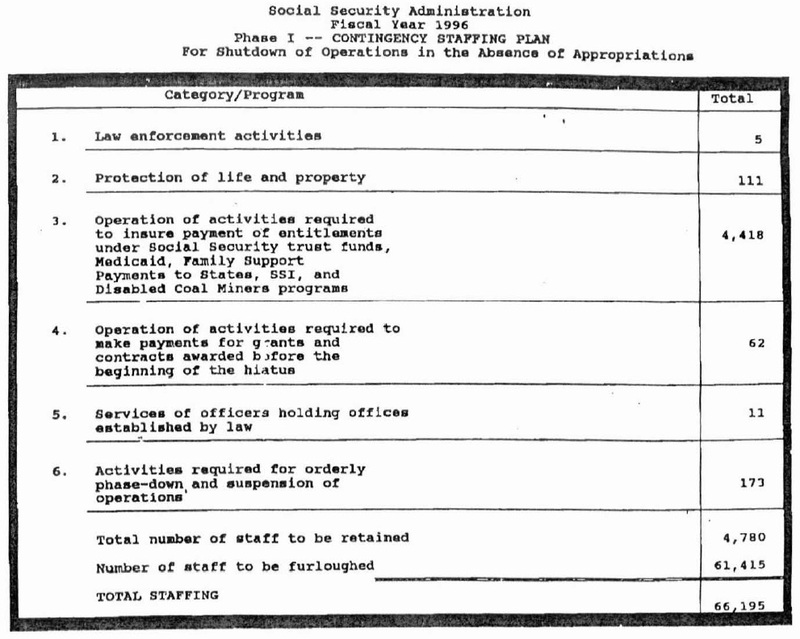 You also asked about the cost impact on SSA of the shutdown. While we have not completed our review of the cost to SSA of the shutdown, SSA's major cost was the cost of paying furloughed employees. We estimate that payroll costs f o r furloughed employees amounted to $43 million for the four full business days during the shutdown period. Additional costs incur red include full rental costs for SSA facilities, even though most were minimally staffed, and costs for services which we paid for, but did not receive, such as training. With respect to t he guidance provided to furloughed employees concerning such issues as pay and unemployment compensation, I am pleased to report that we were able to keep employees fully informed before, during, and after the furlough. OPM was helpful in providing us with information from the Department of Labor about unemployment compensation, and we were able to pass this information along to our employees. As SSA updated its contingency plans, we provided written questions and answers about furlough issues to all employees before the start of the fiscal year. I updated this information by means of electronic mail messages to all employees as the possibility of a funding hiatus increased. A communications network of designated furlough contacts was established to disseminate information quickly throughout SSA via electronic mail, conference calls, and meetings. We have also been operating a telephone hotline to provide employees with information and instructions before, during, and after the furlough. For example, during the furlough, the hotline assured employees that they would receive on time their pay due on November 21 and gave specific instructions for filing applications for unemployment compensation. SSA has no subsidiary agencies. We do, however, provide 100 percent of the funding for the operations of State Disability Determination Services (DDS), which make disability determinations for SSA. Although DDS employees are State employees, their salaries are fully funded through SSA's appropriated funds. We notified the State DDS 's of the impending shutdown and informed the Governors we could not f und DDS operations for the shutdown period. Finally, you raised several questions regarding our assumptions about the length of the shutdown, and the effect of such assumptions on decisions as to which functions should be continued during the shutdown period. We conduct about 2,700 hearings per day. Although a very brief shutdown only slightly disrupts the services we provide, I think it is obvious that an appropriations lapse of one to two weeks would cripple SSA' s ongoing ability to properly administer the programs for which it is responsible, and could seriously impair its capacity not only to distribute accurate payments to current beneficiaries of all of its programs, but also to process pending claims and appeals. Although we did not make any specific assumptions about the length of the shutdown, our contingency plan provided for a range of appropriate adjustments we could make in the event of a prolonged shutdown. Thus, when the President asked that SSA review its shutdown plan in light of the length of the shutdown, we decided to implement a phase of the plan that expanded the number of excepted employees by about 50,000 effective November 20, in order to ensure that SSA could accept and process new claims applications. Of course, since the shutdown ended and all employees returned to work on November 20, we did not have to implement this decision. I deeply regret any hardship or inconvenience which members of the public and SSA employees may have suffered as a result of the shutdown. However, I believe that SSA implemented the shutdown in an orderly manner and in full compliance with appropriate directives and guidance from OMB. Obviously, in the interest of the public we serve and the employees who provide the services, I want to express my sincere hope that we will not have to implement shutdown procedures in the future. The Office of Management and Budget (OMB) guidance requires that each agency develop an operational plan for an orderly shutdown, in the event of a lapse of appropriations. SSA's contingency plan (CP) consists of individual plans which are developed and maintained by Deputy Commissioner (DC) - level components. If notified by OMB of a funding lapse, the Commissioner will activate the SSA's Command Post, which will oversee the implementation of the Agency CP and provide guidance. The Command Post (comprised of a representative from the Office of Personnel and each DC component) will immediately notify the DC-level component heads to implement their individual CPs. Select, immediately, a minimum number of support staff to be retained to perform work authorized by law during a lapse in appropriations. The remainder of employees will be furloughed. Notify the Office of Systems of component telecommunications requirements, as soon as the number of support staff has been determined. Provide, immediately, to the Office of Personnel (OPE), Office of Human Resources (OHR), the names and number of employees to be retained and/or furloughed. This list should include the employees' retention/furlough status, SSNs and timekeepers' numbers. --Managers should also maintain a separate list with employee home telephone numbers and addresses. --Managers should notify employees that they are either excepted or nonexcepted from the furlough. Immediately notify those employees, verbally, who will be released and inform them of their rights and responsibilities. OPE will use the public address system at Headquarters to convey information regarding lapsed appropriations and the release of employees scheduled to be furloughed. DCs with field components will advise them to implement their individual CPs. Terminate all work activities not authorized by law during a lapse in appropriations, immediately. --A checklist of basic functions/activities is provided in SSA's Administrative Instructions Manual System 17 .01 (Contingency Planning, Policy and Procedures - - Funding Lapse) to determine which functions are authorized and which functions are not authorized during a lapse in appropriations. Cancel, immediately, scheduled conferences/meetings, and discontinue training not authorized by law during a lapse in appropriations. Advise employees in travel status to immediately return to duty stat ions; no further travel will be authorized. Cancel, immediately, overtime and compensatory time, unless authorized by the Commissioner for excepted functions (via the Command Post). Notify, the Command Post, as soon as possible, when individual component CPs have been fully implemented. The Deputy Commissioner for Finance, Assessment and Management is responsible for determining which services are needed for continuing functions in each location (e. g., lights, water, air-conditioning, etc. ), and coordinating shutdown of facilities. The Deputy Commissioner for Human Resources is responsible for the processing of furlough actions (if a continuing resolution or an appropriations bill is not passed with in a few days of furloughing employees). The Deputy Commissioner for Operations is responsible for ensuring that appropriate signs/notices are posted at public contact offices, stating that offices will be open to continue to carry out activities authorized by law, on a limited basis. The Deputy Commissioner for Programs, Policy, Evaluation and Communications is responsible for notifying the Federal, State, local and public agencies (dependent upon SSA for information) of the cessation of SSA activities. The Press Office is responsible for maintaining contact with the news media to keep the public and furloughed employees informed. The Deputy Commissioner for Systems is responsible for coordinating any equipment shutdown/startup ( including telecommunications equipment ) to avoid power surges, systems overloads, etc. Once the word is received from OMB to resume operations, the Command Post will communicate this to the DC-level component heads, who will implement the startup/recall provisions of their CPs. The Press Office will immediately notify the media to announce resumption of SSA's operations. --Employees would already know to listen to certain radio and TV stations for the announcement. Office heads will notify subordinate managers, by telephone, who will notify employees of date and time to return to work. As startup f unctions are resumed, managers should, immediately, relay information upward to the next level of command; the DC-level component heads will, in turn, communicate this to the Command Post. --Any significant problems hould be reported promptly to the Command Post. The Command Post will be dismantled, as soon all DC-level components have reported attainment of a normal level of operations.